Just Listed - Home for Rent with Panoramic City Views! Offering a multitude of amenities with a rare one-of-a-kind location, this 2002 DR Horton home includes 5 bedrooms, 4 baths, and 4171 finished square feet. This unique location in Castle Pines North backs to a greenbelt that offers open space views and panoramic views of Denver beyond that. Deer and elk roam the open space behind and the buffalo herd can be seen to the West from time to time! 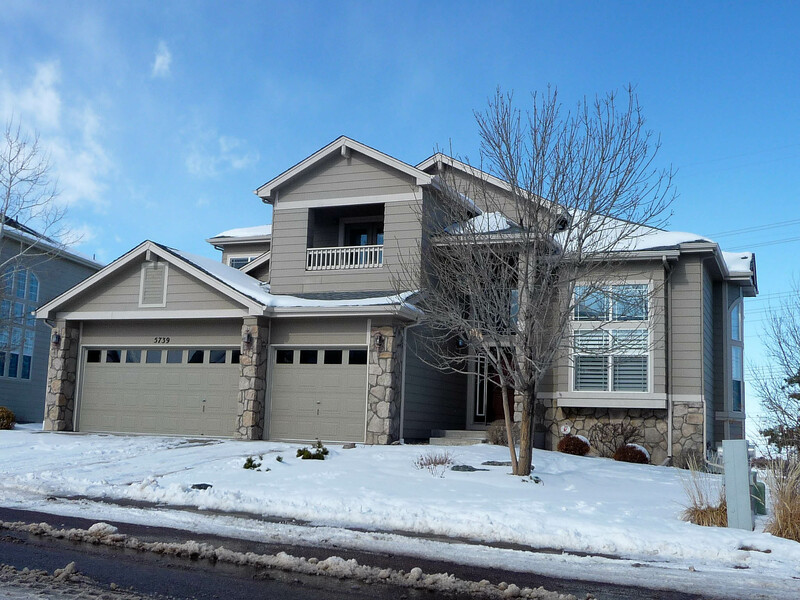 Highlands Ranch is 10 minutes away just down the hill, and there is plenty of local shopping nearby, as well as parks, walking trails and the community pool. The striking floor plan provides a very open feel and has a perfect flow to it, and really offers something for everyone. Huge 18’ vaulted ceilings bridge the front living room/dining room space with the kitchen, and then flow into the 2 story family room. The island kitchen offers Maytag appliances with double oven/flat-top stove combination, rich Oak cabinets with built-in pantry, tile backsplash and tile floor. The breakfast nook walks out to the full length deck, which provides a nice outside living space and endless entertaining possibilities. The family room features an amazing bowed wall of windows, gas fireplace, and entertainment center with surround sound. Above the family room is a spacious loft, as well as 2 secondary bedrooms (one with its own outside balcony) and large hall bath. The main floor master features private deck access and large 5 piece bath with walk in closet and large corner soaking tub. The fully finished walkout basement is sure to get some heavy use! Not only is there space for the ping pong or foosball table, but you have a full wet bar and complete home theater with Epson projector, professional screen and components, surround sound, and 4 cozy theater chairs. Two large bedrooms and another full bath round out the space, and there is a full length patio out back. Other amenities include luxurious plantation shutters and Hunter Douglas blinds throughout, tinted windows, epoxy garage floor, fenced yard with mature landscaping, and air conditioning.